Designers and homeowners continue to love the look of white walls for kitchens, dining rooms and living spaces, but there are hundreds of shades in the white color palette. Choosing the right one is critical to achieving the look and ambience you’re striving for. "You'll want to consider three key factors when choosing the perfect white," explains Sara McLean, color expert at Dunn-Edwards. "Number one is your home's lighting; second is where you live, and third is the architectural style." According to McLean, north-facing rooms don't tend to have as much natural light, needing warmer whites to give the space some life. Warm whites are those with yellow, brown or even red undertones. Conversely, south-facing rooms get more sunlight, so cooler whites—those with subtle gray or blue tints—can help add balance. 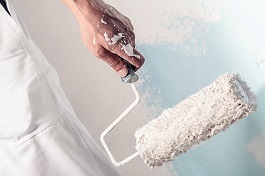 "Be sure to paint large samples on the walls and live with them for a couple days. You'll be able to see how the light reflects off each color at different times of the day." Where you live is yet another factor that has a big influence on which whites to choose for your home. Warmer whites work well in northern climates, which have cooler, bluer natural lighting. Conversely, southern climates tend to have warmer, natural lighting, so cooler whites can help create a clean, cool look. Your home's architectural style can also help narrow down your choice for whites. Warmer whites are ideal for traditional Spanish-style and desert ranch and Craftsman homes. Tropical designs come alive with tinted and warmer whites that reflect the natural elements in the room, such as wood and bamboo. Mid-century modern homes and Scandinavian designs tend to favor neutral and cooler whites. Be sure to carry out your due diligence instead of just choosing any white. The differences among them may be subtle, but the variance in results is dramatic. Contact me today for more home decorating tips and real estate information.